Designed primarily with the Roland TR-808 / TR-606 and the EDP Wasp / Gnat in mind, the PRO-KADI can, in fact, be used to trigger many drum machines and other devices. Cheaper than a retrofit and just as effective, it can be used with the TR-808, TR-606, CR78, CR8000, Wasp and many, many more. Most drum machines do need a small modification to run with this interface. 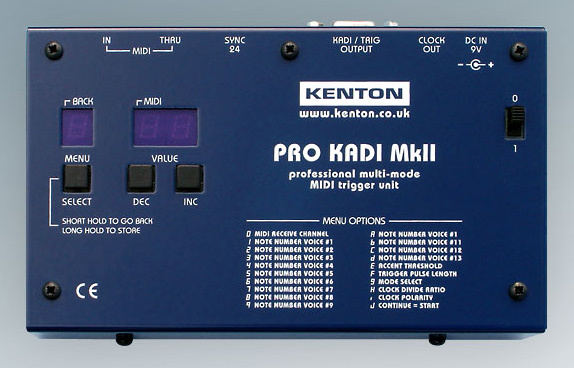 Kenton can supply and/or fit sockets kits to interface your drum machine with the PRO-KADI. Kits are available for the TR-808, TR-606, CR-78 and CR-8000. 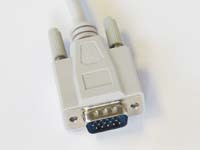 The Pro-KADI can also be used to trigger the voices of the Simmons SDS-V and SDS-7 however you will need to make your own breakout cable for this. 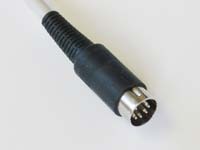 This multi-mode MIDI trigger unit is highly configurable and capable of driving up to 13 outputs. Hundreds of other control applications exist, such as lighting control, robotics and ignition of small explosives for theatre productions. Please email us if you have a specificic MIDI control project. Signal leads are sold separately. Remember to select the correct unit for your make and model of synth. Power: 9-15V DC. Products bought directly from Kenton are supplied with the appropriate power supply for the delivery address. Four types are available, UK / EU / USA / Australia. Please ensure that you select the correct version below for your synth. Since the 4th October 2006 price review, a power supply (wall wart) is now included with this product . Three types are available, UK / EU / USA. We will automatically supply the correct type for your country.